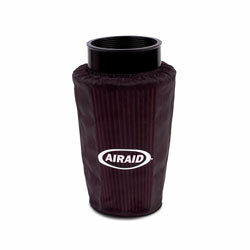 Works great keeps the large particles off the filter to make for easy cleaning. Looks appealing and fit was perfect. Shipping was fast no complaints here. This pre-filter is something everyone should have for wet or dry filters. It makes cleaning the filter so much faster and easier. No more weed seeds stuck between the filter folds. I have not noticed any reduction in mileage or performance with this product (just as stated in the manufacturer's info). Love this filter wrap. Long lasting.